On Saturday APD Dumfries lost a close match against Drumpellier at Nunholm in the Western Premier League. Alan Davidson and Drew Dawson put on a fine century opening stand for the Nunholm side but from there the complexion of the innings changed. A change of bowlers reduced the scoring rate and both openers were dismissed including Davidson, the Lakeland Fluid Power Man of the Match, for the top score of 55. That, a good catch, and an unfortunate run-out, put Dumfries at 133 for 4 with fifteen overs left. Skipper Beveridge provided six boundaries in his score of 36 but the loss of wickets plus a couple of unnecessary dismissals meant the innings never regained the necessary momentum and the side were all out for 202 with three wickets for the professional Ramzan and four for Rawlinson. On a previously sunny day a heavy rain interruption then intervened to reduce the Drumpellier innings to just 28 overs and a revised winning target of 150. Dumfries started well with Niall Alexander and Peter Lojszczyk each taking a wicket in their second overs. Thereafter, in an innings with the tone of a 20/20 match, Drumpellier hit fours and sixes and each of the bowlers chipped away with wickets to keep the result in doubt. However Dumfries did take enough wickets and the winning runs came with nine balls and three wickets left. McLaren was not out with a vital 48 not out. Dumfries next play Ayr on Saturday at Nunholm. 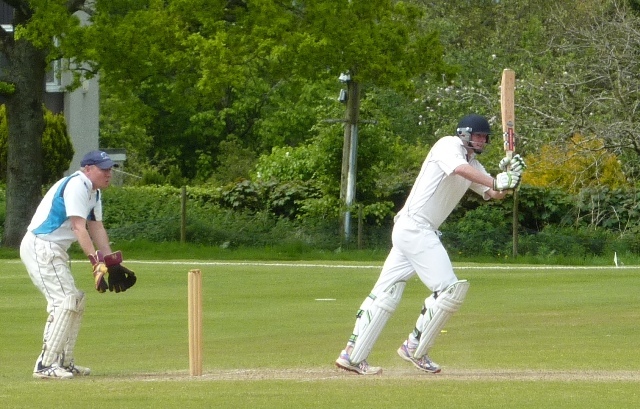 Also on Saturday Eco-Genics Nunholm lost their Western Premier Reserve League match away at Langloan. Marcus Richardson hit 58 in the Nunholm total of 179 for 9, and was the Access Mechanical Handling Man of the Match, and Jerry Goodin then took three wickets but Langloan hit the winning runs with five wickets and five overs left. Junior Coaching: Monday night junior sessions take place at Dumfries Sports Club, Nunholm, from 6:15-8. For more details about Junior, Senior and Women’s cricket contact Trefor Williams on 01387 256455, or the Club on 07799 856094, dumfriescricketclub@gmail.com.